year’s Ing Cup World Professional Goe Championship. Yang, taking White, beat Kim on January 28 (see below left for game record) and then, taking Black, defeated Feng Yun on January 29 (game record at right). The knock-out North American Ing Cup Selection Tournament was held on IGS. Established in 1988, the Ing Cup was the first worldwide international professional tournament. With $500,000 in prizes, it has the largest prize of any international tournament. Every four years, 24 top players from around the world are invited to play. Spots are still available in the Chunlan Cup 2012 Selection Tournament for professionals and amateurs 6-dan and stronger. U.S. citizenship is required. Registration closes at midnight on Thursday, February 2nd. 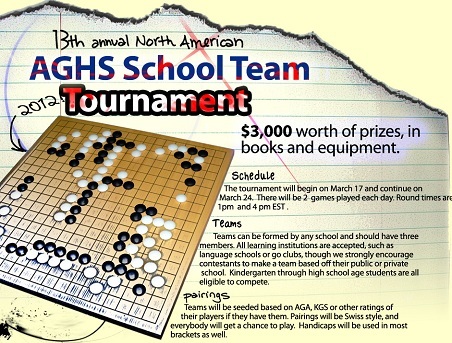 To register for this tournament, email tournaments@usgo.org. Click here for full details on the tournament schedule, rules and procedures. Fourteen-year-old Calvin Sun 7d reasserted his position as the strongest youth player in America this past weekend. He entered the double elimination finals for the US Youth Go Championships as one of four finalists, in the Senior Division, but went on to win every game in a dynamic show of force. Andrew Lu 6d was the only player to beat Sun in the qualifiers, also scoring a win against Hugh Zhang 7d, which gave him the top slot as the finals began. Lu started out well, defeating Zhang again in the first round of the finals, while Sun beat Matthew Harwit 4d. Round 2 saw Zhang knocking out Harwit, while Sun got even with Lu for his earlier defeat. Next Lu and Zhang squared off, but Zhang was determined not to lose a third time to Lu, and knocked him out in a strong third round showing. Zhang was now aiming for Sun again, the two boys have been rivals for years, competing in the Redmond Cup and other events since they were both small children. 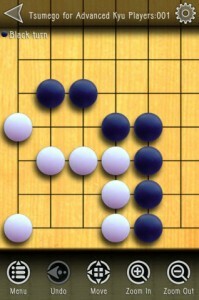 Sun stood his ground yet again though, knocking Zhang out in the exciting final match – and claiming the championship. The games drew over 200 spectators on KGS, and a great deal of enthusiasm from US youngsters who had competed in the qualifiers the week before. Sun will go on to represent the US at the World Youth Go Championships this summer. In the Junior Division, Aaron Ye 4d and Jeremy Chiu 4d faced off against Daniel Liu 3d and Justin Ching 1d. Ching was knocked out, setting the stage for a showdown between Liu, Chiu, and Ye. As all three boys live in the Bay Area, they will compete live at the BAGPA ratings tourney on Feb. 11. -Paul Barchilon, E-J Youth Editor. Photo by Brian Allen: Calvin Sun at the US Go Congress. Fifteen year old Vincent Zhuang 6D won the 2012 Jin Chen Memorial Tournament on Jan. 8. 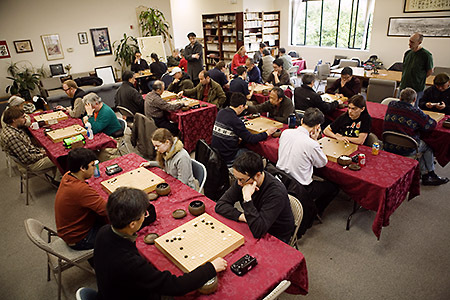 The annual tournament attracted 42 players, and was the largest AGA-rated event at the Seattle Go Center in several years. 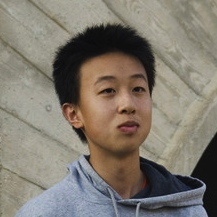 Zhuang is a 10th grader living in Portland, Oregon. 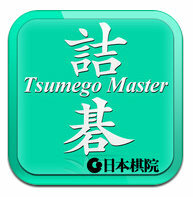 He won the 19×19 Iwamoto Youth Tournament at the Seattle Go Center two and a half years ago, when he was rated as a 1 kyu. This time he bested several 7 dans in the open section. The total prize money was $1,000, thanks to a matching donation from the Ourjin Foundation. Winners in the Open Section were: Vincent Zhuang – 1st, Dong Baek Kim – 2nd, Edward Kim – 3rd, Jon Boley – 4th, Dong Ho Kim – 5th. “A” Handicap section: Chris Kirschner – 1st, Daniel Top – 2nd, Takehito Furuyama – 3rd. “B” Handicap section: Peter Christensen – 1st, Larry Eclipse – 2nd, Frank Brown – 3rd. “C” Handicap section: Bill Thompson – 1st, Gaurav Oberoi – 2nd, Yuriko Miyake – 3rd. If you’d like to help put together the 2011 American Go Yearbook, email journal@usgo.org Experience with InDesign preferred. Be part of the team producing the annual collection of the best material from the American Go E-Journal. NOTE: as with all go tools, from apps and software to books and equipment, we’re interested in your opinions; email journal@usgo.org with your comments/reviews on this and other go tools.